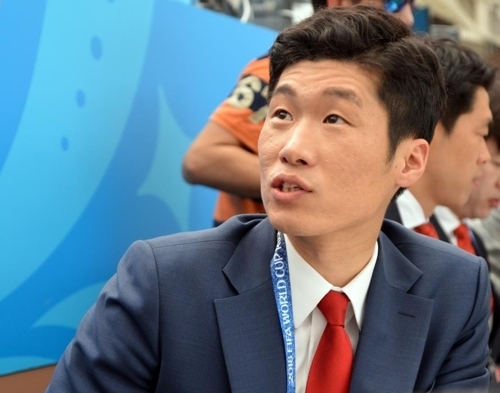 MOSCOW -- South Korean football legend Park Ji-sung believes Mexicans are likely to use different tactics against South Koreans, after watching Mexico's stunning win over Germany at the 2018 FIFA World Cup. Park is currently in Russia working as a commentator for South Korean broadcaster SBS. On Sunday, he was at Luzhniki Stadium to comment on the match between Germany and Mexico, the two opponents that South Korea will face in Group F after playing against Sweden on Monday. The Group F opener ended in a shocking 1-0 loss for defending champions Germany after Mexico's Hirving Lozano's right-footed strike in the 35th minute turned out to be the only goal of the match. After watching Mexico's performance, Park said South Korea need to come up with a tactic that can handle their opponents' high-pressing game. South Korea will meet Mexico at Rostov Arena in Rostov-on-Don on Saturday after opening their Group F campaign against Sweden at Nizhny Novgorod Stadium in Nizhny Novgorod on Monday. "I think Mexico will play a high-pressing game to attack," he said. "This means they could have a thin defensive line, and we have to think about how we can exploit it." Park, who hung up his boots in 2014, said South Korea don't need to thoroughly analyze Mexico's tactics against Germany because he expects that the Latin Americans will use different tactics. "I'm sure Mexico will use different tactics," he said. "For this match, Mexico started with tactics that are prepared only for Germany. We just need to check the characteristics of each player." Park lauded his former Manchester United teammate Javier Hernandez, who is better known as Chicharito. Hernandez assisted on Lozano's winner to help his country to the historic win. "He did his job well and dismantled Germany's defense with one-two play in counter attack situations," he said. "He was calm until the last touch. If Germany's Timo Werner were in that situation, he would have tried to finish on his own, but Hernandez was unselfish." For South Korea, Germany's loss wasn't the result that they wanted. South Korea were targeting a second place in the group, hoping Germany would beat both Mexico and Sweden before meeting them. But with the latest result, Germany are now fighting for the runners-up spot in Group F.
South Korea and Germany will go head-to-head at Kazan Arena in Kazan on June 27. "For us, Germany have to beat Mexico and Sweden, but this is the result what we got," he said. "Our players should focus on our match. We'll meet Germany last in order, so before that we need to collect points (in the first two matches)." Park pointed out that Germany will do their best against South Korea, and the players should be ready for a tough challenge. "Germany didn't show title contenders' performance," he said. "They lacked accuracy, sharpness and solidness in attack. They'll now carefully prepare to pass the group stage, so we need to be ready." When asked about words of advice for South Korean players, Park, who retired with 13 goals in 100 caps, said they should take a look at Iceland's performance against Argentina. Iceland in their World Cup debut collected a surprising 1-1 draw with Argentina in their Group D contest on Saturday. "Iceland players knew what they had to do on the pitch and especially, they appeared to have a good control of their stamina,"
he said. "To prevent burnout, they didn't go for reckless attacks and they showed a good spirit on the pitch. It's something South Korea should learn." For Park, Luzhniki Stadium in Moscow is a place where he doesn't have a good memory. Park was at Luzhniki Stadium in 2008 when Manchester United were playing against Chelsea in the UEFA Champions final. The 37-year-old, however, wasn't even on the bench then as Sir Alex Ferguson dropped him from the match day roster. Ten years later, Park appeared at the stadium again and this time he was also not on the bench.